Computers require regular maintenance in the same way that cars do. You should defragment your hard drives regularly in Windows Vista to improve your computer’s speed and efficiency. When files are deleted, this leaves gaps of space on the hard drive. When you save something new or install a new program, that code can become fragmented across the hard drive as it fills these non-consecutive “holes” with its data. When you defragment your computer, you remove all the gaps, and Windows Vista rearranges the placement of all the files into the most efficient pattern. This helps your computer access files more quickly and enables it to find larger sections of memory for saving new files and programs. Choose Start→Control Panel→System and Maintenance and then click Defragment Your Hard Drive in the Administrative Tools. 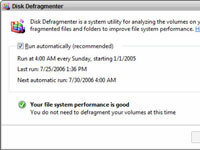 The Disk Defragmenter window opens and begins analyzing your computer to determine how fragmented it is. If you have User Account Control enabled on your computer, you’ll see a message box asking if you’re sure you want to go to the Disk Defragmenter. Just click Continue to open the Disk Defragmenter window. 1Wait for the Analyzer to finish. You will see a message saying either that your file system performance is good or that you should defragment your computer. 2If necessary, click Defragment Now. A message appears that Windows is defragmenting your drive and that it may take up to a few hours to complete. 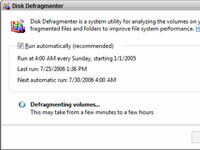 The Disk Defragmenter window will give you a message to let you know when your drive no longer requires defragmenting. They aren’t kidding about the hours thing. Disk defragmenting can take a long time, particularly if you have a larger hard drive. So, try running your defrag overnight while you’re happily dreaming of much more interesting things. To help things move along faster, turn off any energy-saving features (such as a screen saver), as they could cause the defragmenter to stop and start all over again. 3If you want to schedule your defrags to run automatically, check the Run Automatically checkbox. 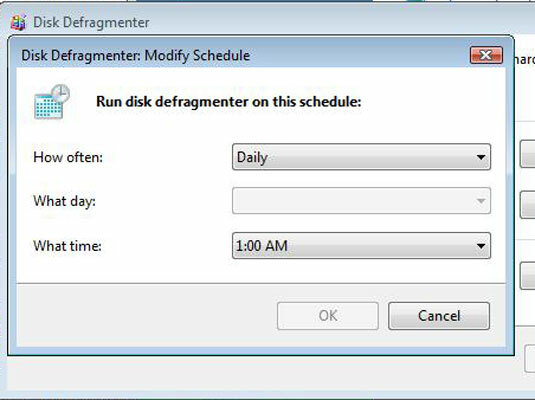 By setting up a regular schedule for the Disk Defragmenter to run, you can streamline the process and keep your system running smoothly. 4Click the Modify Schedule button. You can set up the procedure to run automatically at a preset period of time, such as once every two weeks at 2:00 a.m. If you have multiple hard drives on your computer, you will see a Select Volumes button. 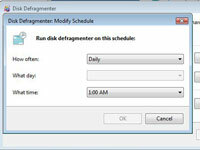 Click this button to establish which drives the defragmenter should tackle when it runs its scheduled maintenance. Just click OK when you’re finished making your selection. 5Click OK and click Close to close the Disk Defragmenter. Of course, you’ll need to leave your computer running for the scheduled defragmentation to occur.